The digital EL1859 EtherCAT Terminal combines eight digital inputs and eight digital outputs in one device. The inputs have a filter of 3.0 ms. The outputs process load currents up to 0.5 A, are short-circuit-proof and protected against polarity reversal. 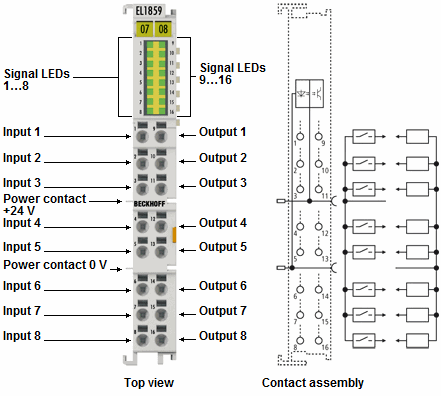 The signal states are displayed by LEDs. The reference ground for all inputs is the 0 V power contact, the outputs are fed via the 24 V power contact. The conductors can be connected without tools in the case of solid wires using a direct plug-in technique.